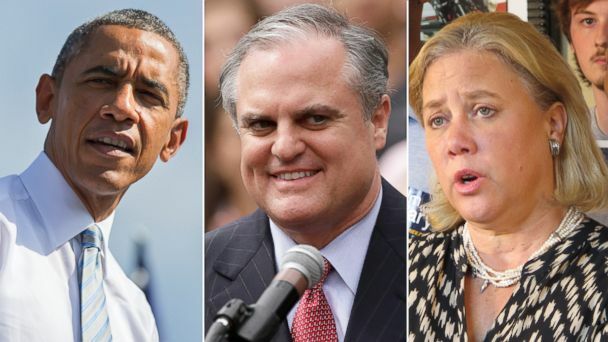 Barack Obama and his political party are heading into the midterm elections in trouble. The president's 40 percent job approval rating in a new ABC News/Washington Post poll is the lowest of his career - and the Democratic Party's popularity is its weakest in polling back 30 years, with more than half of Americans seeing the party unfavorably for the first time. The Republican Party is even more unpopular. But benefitting from their supporters' greater likelihood of voting, GOP candidates nonetheless hold a 50-43 percent lead among likely voters for U.S. House seats in the Nov. 4 election. These and other results are informed by an array of public concerns on issues from the economy to international terrorism to the Ebola virus, crashing into a long-running crisis of confidence in the nation's political leadership. Almost two-thirds say the country is headed seriously off on the wrong track. Even more, three-quarters, are dissatisfied with the way the political system is working. Scorn is widely cast: Among those who are dissatisfied with the political system, two-thirds say both sides are equally to blame, with the rest dividing evenly between Obama and his party, vs. the Republicans in Congress, as the chief culprits. But as a nearly six-year incumbent president, Obama - and by extension his party - are most at risk. 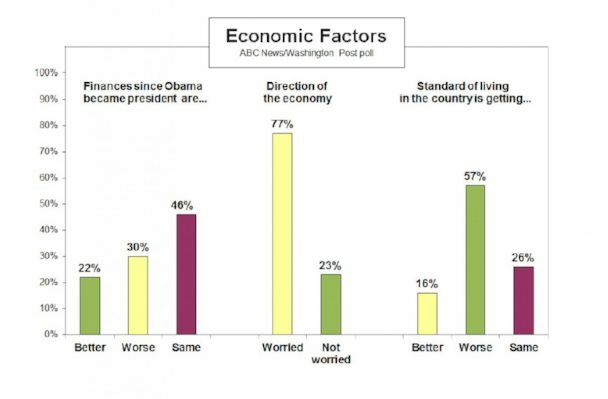 Further, while Obama's negative rating on handling the economy has eased, more Americans say they've gotten worse off rather than better off under his presidency; the plurality is "about the same" financially, for most not a happy outcome. Even with the recovery to date, 77 percent are worried about the economy's future, and 57 percent say the country has been experiencing a long-term decline in living standards - all grim assessments as Election Day looms. History, for its part, offers the Democrats cold comfort. Obama's approval rating matches George W. Bush's heading into the 2006 midterms, when the Republicans lost 30 seats. The only postwar president numerically lower heading into a second midterm was Harry Truman, at 39 percent approval, in 1950; his Democrats lost 28 seats. While race-by-race assessments don't suggest those kinds of losses this year, the comparison adds context to the GOP's upper hand. 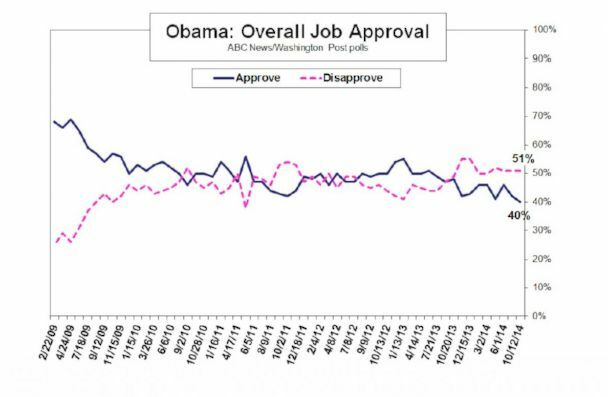 Such results also help explain why Obama is attending his first public campaign rally of 2014 only today, for Gov. Dan Malloy of Connecticut. THE HEAT - As noted, Obama's party is feeling the heat. Just 39 percent of Americans see it favorably, while 51 percent rate it unfavorably - the most in polls since 1984. The Republican Party has a weaker 33-56 percent favorable-unfavorable rating. But while the Democrats have lost 10 points in favorability just since August, the GOP has held steady - and its negative score has eased by 7 points in the past year. A key factor, moreover, is propensity to vote. The national House race stands at 46-44 percent among registered voters in this poll, a non-significant +2 for Democratic candidates. As noted, that flips to +7 in favor of the Republicans, 50-43 percent, when winnowed to likely voters. That shift - a 9-point swing in support for Republican candidates when moving from registered voters to likely voters - is not unusual. 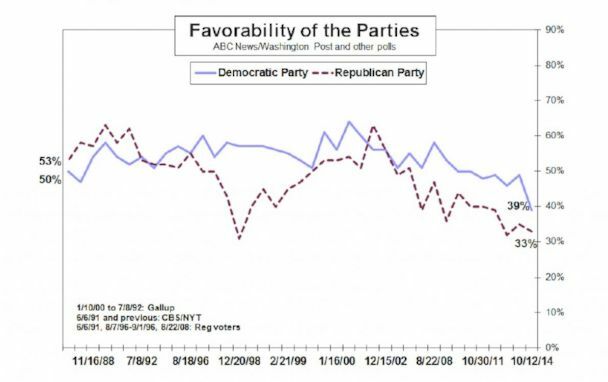 It was almost identical ABC/Post pre-election polls before the 2010 midterms. The differences show up in demographic data. Nonwhites, one of the most solidly Democratic voting groups, make up 28 percent of registered voters, but just 22 percent of likely voters. Republicans account for 25 percent of registered voters, but that rises to 31 percent of likely voters. The share of conservatives gains a scant 4 points. Less-educated and lower-income adults lose 9 and 8 points, respectively, going from registered to likely voters. Vote-preference results, moreover, are consistent across a range of likely voter models. In seven scenarios, with turnout ranging from 42 to 53 percent of the general population, support for Democratic candidates is 42 or 43 percent; for Republicans, it's 50 to 52 percent. With turnout key, there's one measure that suggests the Republicans may be running a more efficient get-out-the vote campaign - an area in which the Obama campaigns of 2008 and 2012 were particularly effective. Among likely voters who say they've been contacted on behalf of a Republican candidate, 55 percent also say they plan to vote Republican. Among people who've been contacted on behalf of a Democrat, a bit fewer plan to vote Democratic, 48 percent - not a large gap, but a potentially important one in motivating turnout. VOTE by GROUPS - Differences in vote preferences among groups also are informative. Among likely voters, women divide evenly between Democratic and Republican House candidates, while men favor the Republicans by 16 points. Political independents support Republican House candidates by 19 points. Whites favor GOP candidates by 25 points. Each of these is almost identical to results of the 2010 national exit poll. ISSUES - Views on issues show how turnout matters. All Americans, for example, split evenly, 39-39 percent, on which party they trust more to handle the main problems facing the country. Among registered voters it's similar, 41 percent for the Republican Party, 38 percent for the Democrats. But among likely voters this becomes an 8-point Republican advantage, 46-38 percent. Indeed the Republicans lead among likely voters on five out of eight issues tested in this survey - including, notably, a 13-point lead over the Democrats in trust to handle the economy, which leads easily as the top-cited issue in the election. The GOP also has an 11-point lead among likely voters on handling immigration, 17 points on handling the federal deficit and 22 points on handling the U.S.-campaign against ISIS. The two parties run evenly in trust to handle health care; the Democrats lead only in two others - trust to better help the middle class, by 8 points, and trust to handle issues of particular importance to women, by 22 points. ACE? - That advantage on women's issues could be an ace in the hole for the Democrats - but the disadvantage on ISIS could be a hole in that ace. The question is whether preferences among women who are focused on security issues water down the Democratic advantage on women's issues overall. Such women have been heard from before; they were a critical element of George W. Bush's re-election in 2004. Something like that may be happening again. Among likely voter women who say they're worried about a terrorist attack in the United States, GOP candidates lead by 55-39 percent. Among the relatively few who are not worried about terrorism, Democratic candidates have an overwhelming lead. TWO MORE - In two more issues, likely voters are 11 points more apt to say the Democrats, rather than the Republicans, come closer to their views on abortion, and it's a 13-point gap on gay marriage. But the results also show that these issues are not exclusive concerns. Specifically, among likely voters who say the Democratic Party is closer to them on abortion, 22 percent support the Republican in their congressional district nonetheless. Among those who say the Democrats are closer to them on gay marriage, 25 percent support the Republican candidate regardless. There's less crossover among Republicans - 12 and 11 percent, respectively. ATTRIBUTES - In terms of attributes, the parties are fairly closely rated on items including being "more concerned with the needs of people like you" (a non-significant +3 for the Democrats), better understanding people's economic problems (+2 Democratic) and better representing "your own personal values," +4 to the Republican Party. In contrast to these close results, the fourth item tested is a breakout one for the GOP: likely voters by a 13-point margin, 48-35 percent, say it has "better ideas about the right size and role of the federal government." There's a dead heat, meanwhile, in views of whether Obama - and the Republicans - have a clear plan to deal with the nation's problems in the years ahead. About two-thirds, in each case, say they don't - another example of the public's political disaffection. Among likely voters, 64 percent say Obama lacks a clear plan. Sixty-eight percent say the same of the GOP. OBAMA - Lastly there's Obama himself. Likely voters by a 12-point margin are more apt to say one reason for their vote is to show opposition to Obama than to show him support, 26 vs. 14 percent. (Most, by far, say he's not a factor.) That's similar to what it was for Bush in 2006 - a 15-point net negative among likely voters. Regardless, whatever the outcome of the election, Obama has two more years to govern - and a hole to dig himself out of. He's got some opportunity - among other factors, 8 percent of all adults in this survey are undecided about his overall job performance, which is more than usual. Another is that the gradually improving economy may yet help him, if the recovery gains steam. But his challenges are serious, and broadly based. His approval rating among independents matches his career low (33 percent); among Republicans it's 9 percent, a point from his low; among Democrats, 76 percent, 3 points from his low. He's at a career low among moderates and a point away from it among conservatives. He matches his career low among whites (30 percent) and nonwhites (61 percent) alike. He's at a career low in approval among women, 39 percent. And the number of Americans who "strongly" approve of the president's job performance, 20 percent, is 2 points from his career low. Nearly twice as many, 39 percent, strongly disapprove. Obama's predecessor, embroiled in an unpopular war, tanked in the second half of his second term, going from 40 percent approval at the time of the 2006 midterms to 23 percent two years later; in all it was the most unpopular second term on record in polls dating to the late-1930s. It's a pattern this president - midterms aside - surely would like to avoid. METHODOLOGY - This ABC News/Washington Post poll was conducted by telephone Oct. 9-12, 2014, in English and Spanish, among a random national sample of 1,006 adults, including landline and cell-phone-only respondents. Results have a margin of sampling error of 3.5 points, including design effect. Partisan divisions are 31-24-36 percent, Democrats-Republicans-independents.